I lurve it! So thankful to Jennifer for her tips, especially the suggestion of coating it with a sealer. I thought the sealer was just a pratical step to protect from damage but its a lot more than that. The acrylic coat gives it a much more polished and finished appearance. It makes my many mistakes (drips, brush strokes, etc.) look intentional and shiny. Woo-hoo. The only bummer is that it only fits my side of the bed which happens to be the side you can't see unless you are really looking for it. So its a bit wasted. I don't want to move the bed over anymore either so this will be its permanent home. What do you think would be a good compliment on the other side? ooh I love it too! You did a great job! Whatever companion you get for the other side it should definitely have similar legs and openness to it. oh wow! great job - it is beautiful! Amazing! It looks great next to the bed... Great job! Have you tried the other table you bought , it would look pretty painted similarly ?? WoW! The transformation is amazing! I love it! The other side of the bed is pretty tight. The round table wouldn't fit. I only have about 15 inches. WHEN I SAW THE "AFTER", I LOST MY BREATH. FABULOUS!!! Love it! Fabulous paint job! Now on the look out for my own flea market find! Lovely! I think a little mirrored table would look greatwith it! wow...this looks terrific!!! But your projects always look terrific. That is sweet. I have a dresser and a headboard in a similar finish (the dresser was inherited from my grandmother, and sadly is actually mahogany, the headboard was a craigslist buy) -- maybe when we actually get around to a) purchasing a house and b) decorating it I'll try something similar. looks gorgeous! i have an old piece of furniture (it was in my father's nursery!) that i want to refinish. can you post instructions on how you refinished this piece of furniture? Wow, I love it! What a stunning transformation! Allie - Instructions on what I did is in the post about repainting this item last week. You must be thrilled- you have this lovely piece of furniture- and you did it! What a sense of accomplishment. I always enjoy your projects. Everything is so elegant--the table itself, the colors your picked, everything. It's gorgeous. Ooh, so pretty! It's looks so fab. Love, love, love it! Can you tell us what type of sealer you used? Also, what is the color gray? It's just right!!! it looks absolutely fantastic! love the color choices. It looks great! I love the grey and the white you have chosen. You did an amazing job! Love the color! Wow, it really came out lovely! Great job! It looks like such a high-end piece! Great job!! :) New to your blog & am loving it! Amazing! You've completed this project in no time at all. Looking forward to what you plan on the other side of the bed. Oh that turned out SO pretty! I know you must love it. I was gonna say a round table on the other side, but I see you already said it wouldn't fit. It's beautiful! You have given it new life. You are truly talented! i've been looking for THAT color! what is it?!?!?! 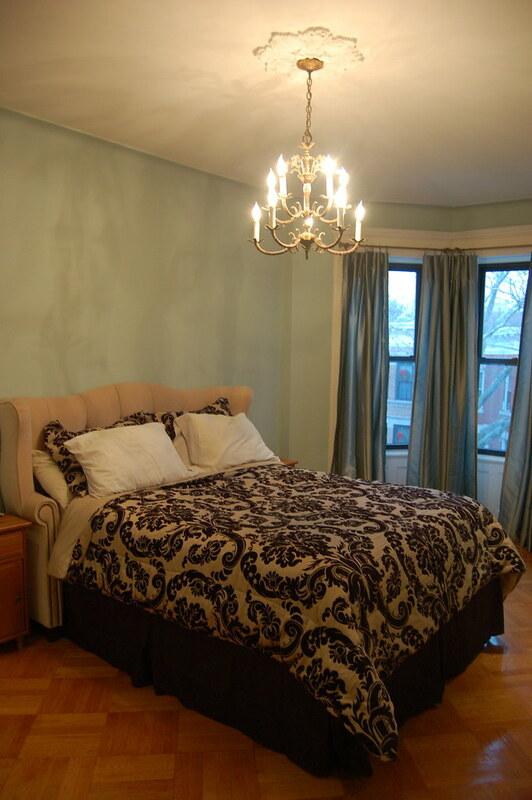 The paint color is Bedford Gray by Martha Stewarts Valspar paint. YAY! It came out fantastic! I wonder if you can find a fancy-vintagey stand lamp, since you're pressed for space on the other side. I love the bed - can I ask where it's from?